You can use TextExpander by Smile Software to efficiently create OmniFocus actions on Mac & iOS that incorporate a second context. How to use TextExpander to quickly create OmniFocus actions on both Mac and iOS. How to create actions with more than one context by using specific naming conventions. How to search for specific types of actions (e.g. phone calls) based on these naming conventions. How to create an OmniFocus perspective that incorporates a search for specific types of actions (Pro edition). Click the "Download Snippets" button to download a zip file containing the TextExpander Snippets that are featured in this video. To add these snippets to TextExpander, simply double-click on the enclosed TextExpander file. 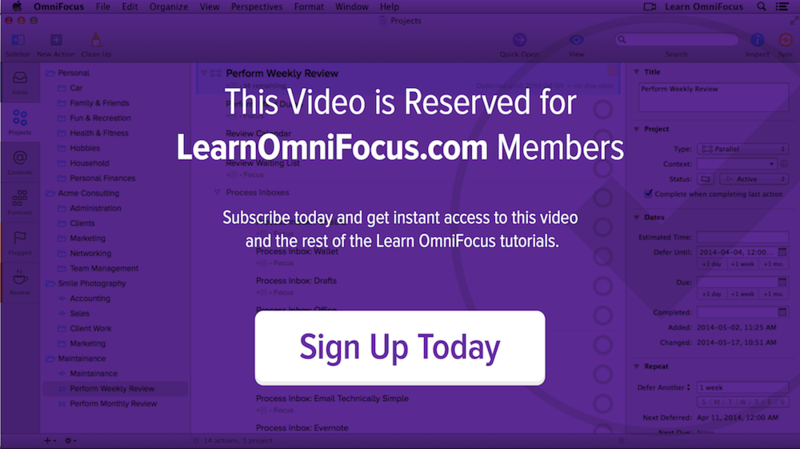 A new group called "Learn OmniFocus" will be created that you can customize as needed. Sprechen Sie auch Deutsch? Thanks to Learn OmniFocus Members Martin Jean and Clemens Schleicher for translating the snippets into French and German. ScreenCastsOnline — By becoming a ScreenCastsOnline Member you'll have access to 500+ Mac and iOS tutorials, including in-depth screencasts that focus on TextExpander. Your membership also include a complimentary subscription to the ScreenCastsOnline Monthly magazine.